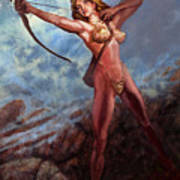 Artemis Diana by Will Brown - 5.125" x 8.000"
Artemis Diana art print by Will Brown. Our prints are produced on acid-free papers using archival inks to guarantee that they last a lifetime without fading or loss of color. All art prints include a 1" white border around the image to allow for future framing and matting, if desired. 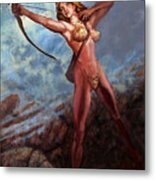 I know that this is beside the point but you do know that Artemis is a maiden. goddess and look at what she is wearing, only a bit of gold chain on her privates. Absolutely stunning. I've also done an archer, only a drawing - nothing like this. You're a great artist. Spectacular art work William. 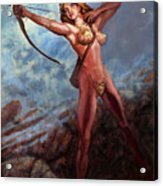 You have a Frank Frazetta style and feel to your art work. Mixed media painting of goddess Artemis/Diana. Originally painted in acrylic and sold on ebay. Digitally enhanced/painted after scanning using Photoshop. This was an early work bridging both traditional media and digital.